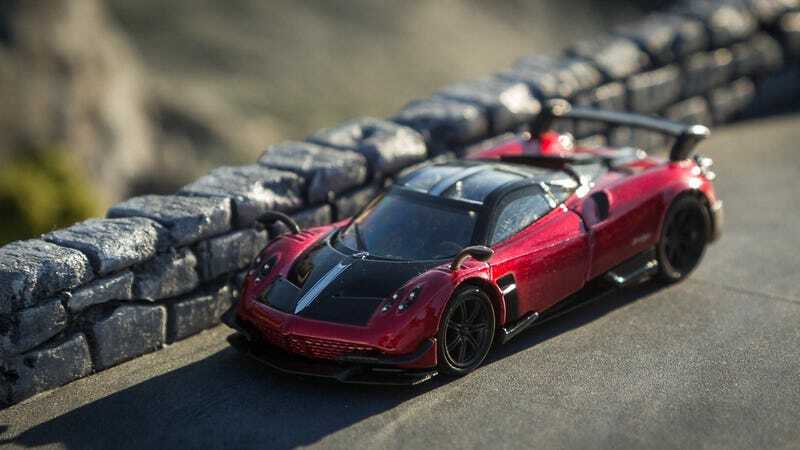 This is the Pagani Huayra BC. Lightweight. Track-focused. Limited to 20 units. There are numerous exterior changes evident, with many wings, an aggressive splitter, and a mammoth diffuser. Not to mention that huge rear wing. As you can see, this model faithfully recreates all of these extreme aspects of the BC. It’s beautifully proportioned and gorgeously finished. Oh, and have I mentioned that this is 1/64? This is from the Taiwan 7-11 set of hypercars. They’re pretty fantastic. Notice the silver script near the rear wheel. This model is beautifully detailed. As you may notice in the picture above though, there seem to be some fit issues with the body. Some of the lines don’t quite match up perfectly. I’m not exactly sure how that happened in a one-piece metal body, but . . . Wait, what? Oh, you think maybe it’s not one solid piece? Well, why would that be? They didn’t stuff an engine in there . . .
Oh my gosh!!! Just look at that AMG V12! Look at that suspension geometry!! Might I remind you that this is 1/64? Look at the exhaust pipes down in there! I hope you’ve enjoyed my pictures. I’m so glad I added this car to my collection. It’s a stunning example of a crazy car. Car week is finally here!! Here are a few shots of the one BC I saw with another Huayra back when it was brand-new. 2016 Exotics on Cannery Row. Oh, by the way. I also have its sibling, the Roadster.